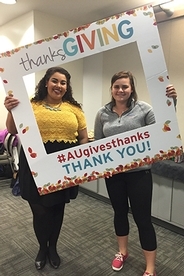 Just before the Thanksgiving holiday, AU students gathered to express their gratitude — by celebrating “thanksGIVING” on campus. This festive annual event hosted by the Office of Development and Alumni Relations on November 20 brings students together to celebrate the impact of philanthropy on AU’s campus. The effect of this generosity is far reaching as 80% incoming freshmen receive some form of financial aid and need-based aid to AU students has more than doubled in the past six years. The Students Today, Alumni Tomorrow (STAT) committee is dedicated to educating students about philanthropy and annual giving. Alumni and supporters give to every facet of AU and their gifts shape the student experience in innumerable ways. Philanthropy enhances the academic experience by providing for extra programs and services, above and beyond what tuition covers. Fueled by coffee, cocoa, and snacks, students learned about donors who support AU and wrote postcards to thank them. Over 160 postcards were written, with more on the way from students who were unable to attend. The STAT committee helped lead the way during thanksGIVING but each student chose to express their appreciation in their own unique way. Students, including Dylan and Sarah, wrote to donors both big and small. Recipients included first-time AU donors, many of whom are recent graduates; donors who gave to the AU Fund for Excellence, which sustains the annual operating budget; and members of the Helen Palmer Kettler Society, individuals who have chosen to include AU in their estate plans. Students who received donor-funded scholarships were also able to write to the individuals who established those funds. For photo highlights from the 2015 thanksGIVING event, be sure to check out the Flickr album. You can also support AU with a gift today.